The text provides detailed treatment of New Zealand's animal welfare legislation including the newly enacted Animal Welfare Amendment Act 2010 and Codes of Welfare. It explains the practical implications of different animal laws as well as the philosophical and historical backgro... read full description below. 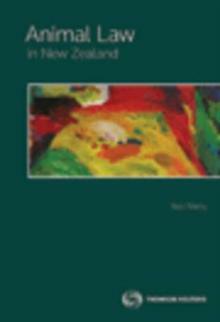 Animal Law in New Zealand is authored by Neil Wells, a leading national and international expert in the field of Animal Law and writer of the New Zealand Animal Welfare Bill in 1997 which then, combined with the Animal Welfare Bill (No.2) in 1998, became the Animal Welfare Act 1999. The text provides detailed treatment of New Zealand's animal welfare legislation including the newly enacted Animal Welfare Amendment Act 2010 and Codes of Welfare. It explains the practical implications of different animal laws as well as the philosophical and historical background to the development of those laws. The author canvasses animal rights, the use of animals in research and testing, transport of livestock, dog control officers and powers, veterinary law, and much more. Animal Law in New Zealand captures the distinctiveness of New Zealand's animal law development. It is essential reading for practitioners, law and philosophy students, animal law enforcement officers, animal welfare inspectors, dog control officers, territorial authorities, farmers, veterinarians, and government officials.